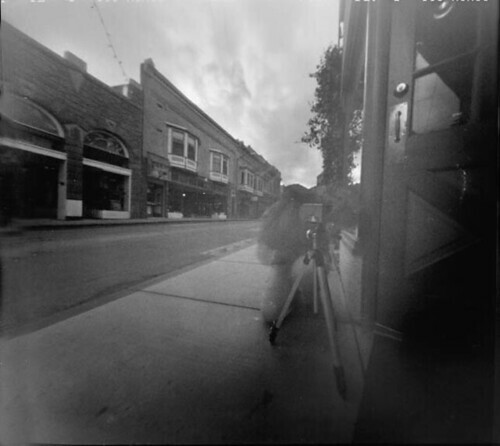 D Stewart PDX's famous "Terminator 3" pinhole camera, Fuji ACROS ISO 100 film, 3 second exposure, Film was developed in homemade "caffenol" developer. Negative was photographed over a lightbox with a DSLR, post-processing in Photoshop. Here she is! D is busy composing a shot with her zero image pinhole camera. I can't tell if her head is just down, or if it's movement kept it from being recorded! I assure you though, D's head is alive and well, even if this portrait seemed to exclude it! It's a mystery!!! While we were photographing on the sidewalk here, we attracted some attention that we pinholers can get sometimes. Some passers-by were quite knowledgeable of pinhole cameras, and knew exactly what we were doing, how the cameras worked, and had tried pinhole themselves at some point. Another man, sitting in the cafe window across the street, made a point to come over to chat with us awhile, too. Thanks D, for a wonderful adventure with you! I sure learned much from you, and I love the Terminator!!! !